There's no getting around it. Even with the best of care, a stay in the hospital is no picnic. Patients are there to recover from severe trauma or major surgery, while others are battling acute and chronic illnesses. During their stay, patients endure the lion's share of discomfort and disruptions—bright lights, beeping monitors, bedpans, sponge baths, diagnostic tests, blood draws, IVs, catheters, cannulas, and yards of plastic tubing—day and night. When patients are discharged and go home, one of the things they crave most is several hours of uninterrupted sleep. But is it possible to help patients sleep better while they are in the hospital? The mock hospital room in the SimTigrate Design Lab at the Georgia Institute of Technology may hold the answer. Though the room is sparsely furnished with only a hospital bed and a lighting control, it serves as an important testing ground for two studies designed to help inpatients rest more comfortably and heal more quickly. The School of Nursing is a collaborator on both projects, initiated when two manufacturers—Philips Lighting and Hill-Rom—asked Georgia Tech architecture professor Craig Zimring PhD and associate lab director Jennifer DuBose MS to analyze their lighting and hospital bed products. The companies came to the right source. A few years ago, Zimring established the SimTigrate Design Lab as an incubator for health care innovation. The lab brings Georgia Tech faculty and students together from multiple disciplines—architecture, industrial design, mechanical engineering, health systems engineering, environmental psychology, and computer sciences—to analyze, predict, and optimize health outcomes. Emory nursing and medical faculty also play a role. Shortly after joining Emory in 2010, clinical nursing professor Susan Shapiro PhD RN FAAN met with David Cowan MSHS, program director of the Health Systems Institute, an initiative of Georgia Tech and Emory, to brainstorm and share ideas. The synergy flowed from there. "Solving problems in silos is not effective," says Cowan, who brought Shapiro and Zimring together as collaborators. "We can achieve the best outcomes by solving problems together." Georgia Tech student Brandon Conway devised a mobile app to enhance the pediatric clinic experience, based on input from Ashley Darcy Mahoney. Georgia Tech's proximity to Emory was among the factors that drew Shapiro to the School of Nursing from the University of California, San Francisco. At UCSF, collaboration with experts outside the health field required a commute of an hour or more. At Emory, Shapiro can catch a shuttle bus and arrive at Georgia Tech in less than 30 minutes. The SimTigrate Design Lab is a few blocks north of Emory University Hospital Midtown (EUHM), where she consults with nurses on evidence-based practice and clinical research through her joint appointment with Emory Healthcare. The short distances are a plus when it comes to building partnerships that benefit nursing education and research. Shapiro now serves as an adjunct research faculty member in the College of Architecture at Georgia Tech. "That's been a very fruitful connection," she says. 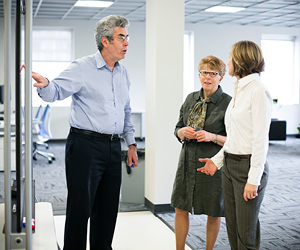 Shapiro provides the clinical perspective that researchers in the SimTigrate Design Lab seek to design, engineer, and build the facilities, products, systems, and technologies that improve health care delivery and outcomes. She also plays matchmaker, connecting researchers and health experts on SimTigrate Lab projects. For the lighting study, Shapiro and DuBose assembled a group of Emory Healthcare nurses, physical and respiratory therapists, dieticians, and physicians to advise Georgia Tech experts on factors and measures related to patient sleep and how sleep may be related to patient outcomes. Their input will help in analyzing the benefits of Philips' HealWell system, which provides general lighting and mimics natural light by adjusting automatically from low light to bright light and back to mirror circadian rhythm. Previous studies have shown that natural light improves sleep and reduces pain and length of stay for patients and eases eyestrain and increases the cognitive performance of nurses. Shapiro also invited EUHM nurses to assist with the hospital bed study. The nurses worked with DuBose's team to develop a detailed model tracing the factors and events in hospital care that can disrupt sleep. Among the disrupters: touch, pain, light, noise, temperature, and psychology related to discomfort and anxiety. Ultimately, the analysis will help inform Hill-Rom's efforts to engineer hospital beds that increase sleep quality and duration for inpatients. "Hill-Rom provides the vast majority of beds in hospitals. Until now, the company regarded the beds as a medical device and had not thought much about sleep," Zimring explains. "We're looking at how to bundle the care process with technology so that patients can get more hours of quality sleep. One idea is to install a bed sensor. If you can sense that someone is asleep, you know not to disturb that patient." The hospital and lighting studies are still under way, and Shapiro is helping ensure the results will help enhance clinical care. "These studies have one thing in common—improving the quality and quantity of sleep for inpatients," she says. "With better sleep, patients can approach the next day more rested and with more energy to participate in physical therapy, occupational therapy, and other activities they need to return them to good health." "One of the reasons I love working with Craig and Jennifer's team is this idea of the built environment in which care is given," she adds. "Within the constraints that we have, how can we alter the built environment to improve patient experiences and outcomes? That's the goal of this team." Like Shapiro, assistant nursing professor Ashley Darcy Mahoney PhD RN NNP-BC knows the Emory-Georgia Tech shuttle schedule by heart. She rides the bus daily from her home in Midtown Atlanta, less than a mile from the Georgia Tech campus. Last fall, she cotaught "Healthcare Design of the Future," an annual workshop led by Zimring, Cowan, and Jim Budd MA, chair of Georgia Tech's School of Industrial Design. Georgia Tech students who take the course devise team projects to improve the care experience for patients, families, and caregivers. Course leaders work with partners throughout Atlanta to expose students to various aspects of health care. Students have designed neurology and neonatal ICUs, emergency rooms, and more. Last fall, six student teams set out to improve the design, efficiency, and cost-effectiveness of urgent and specialty care clinics operated by Children's Healthcare of Atlanta. When course leaders put out a call for nurse and physician collaborators, Shapiro recommended Darcy Mahoney, a neonatal nurse practitioner who studies long-term outcomes for preterm infants. "It was a perfect marriage," Shapiro says. "Ashley took the ball and ran." During the course, Georgia Tech students tapped Darcy Mahoney and Jeremy Ackerman MD, Emory assistant professor of emergency medicine, to learn the fundamentals of health care delivery. "The first lecture I gave was 'Healthcare 101,' " says Darcy Mahoney. "What is a nurse, what is a nurse practitioner, what is a doctor, and what do they do? What are the challenges that we face from a provider perspective, a public health perspective, and a systems perspective? A lot of that is understanding where the Affordable Care Act is going—what that means for providers and patients." As the student projects took shape, Darcy Mahoney guided them on specifics, such as whether scope of practice is the same for NPs in primary care versus urgent care and whether exam room features and devices (such as blood pressure cuffs) could be changed or eliminated to enhance design and efficiency. She provided the big picture view of pediatric care as well. Susan Shapiro (center) is collaborating with Georgia Tech's Craig Zimring and Jennifer DuBose on two studies to improve sleep for hospital inpatients. "I helped the students understand that children are not just small adults and that making things smaller doesn't always make them better," Darcy Mahoney says. "Children's see patients from ages 0 to 22. So how do you make an adolescent and a 4-year-old feel at home in the same clinic space?" 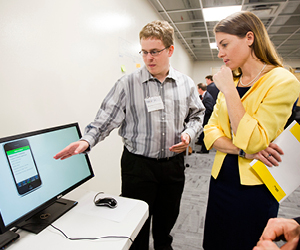 At the end of the semester, the students showcased their work during an open house at the SimTigrate Design Lab. Among their projects: a way-finding system that uses personalized avatars to guide children and parents through their clinic visit, flex-rooms with walls that move up and down to fluctuate with clinic demand, and a mobile app that engages patients and parents more fully in the discharge process. One group of students pooled their respective skills in interior design, human computer interaction, and industrial design to improve wait times and patient flow at Children's urgent care clinics. The students developed a facility model that reconfigured space to better accommodate patients and clinic services, a mobile app prototype that allows parents to preregister before they arrive at the clinic, a lobby kiosk for quick check-in, and a mobile tracking app that enables a parent to follow a child's progress from the waiting room. "Dr. Darcy Mahoney's experience with patients gave me a better feel for important clinic functions and how they work," says Brandon Conway, a Georgia Tech student majoring in human computer interaction. "We're not versed in health care, and she helped us understand acronyms, standards of care, and job descriptions. She was also able to explain why a triage room was in this area rather than that area. We were able to eliminate unnecessary equipment to create a better experience for the child." Conway's experience underscores what the workshop and the SimTigrate Design Lab are all about. "We believe a better design for care can result in a better care experience and better care for a population," Zimring explains. "Knowing that leads to better outcomes and better management of the processes leading to those outcomes." Darcy Mahoney's participation in the course has led to more collaboration. When the NICU nurses at Children's came up with the idea for "Quiet Time"—a built-in time period to shelter sensitive preterm babies from routine noise—they needed an expert who could measure sound. Darcy Mahoney put the nurses in touch with mechanical engineering expert Erica Ryherd PhD. "Once you enter the Georgia Tech family, you enter a world of new opportunities," says Darcy Mahoney. "Dr. Zimring and his colleagues have been unbelievably welcoming to the School of Nursing. They want to collaborate with us more and more using the SimTigrate Lab. The possibilities that holds for teaching and research are endless."